June 8, 2018, Shanghai---- The second Bellagio hotel in the world, following on from the legendary Las Vegas original, Bellagio Shanghai held a grand celebration on the theme of "Bellagio Only" today. This remarkable event also unveiled the impressive premiere showing of the beautiful brand film of this hotel which was directed by the famous film director Lu Chuan. 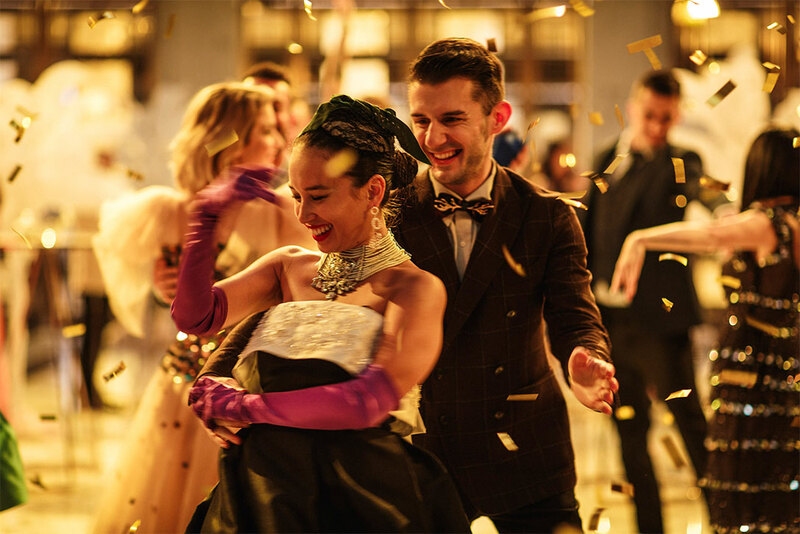 The wonderful moments in the film immersed the guests in the elegance and romance of Bellagio Shanghai and allowed them to appreciate the approachable luxury offered by this legendary brand. Elaborately conceived by director Lu Chuan, working for the first time with a hotel brand, and after nearly a year of creative development, the film has invited the young actress Tang Jingmei and the international supermodel Mariusz Smoliński as the leading roles. Through a man's recollection of the wonderful memories of his life and artistic visual fantasy, the film perfectly captures the brand core values which are "elegant, romantic, beautiful and artistic", immersing the viewers in the scene as they experience the most beautiful and important times in life. The professionally made film was mainly shot in Bellagio’s flagship hotel in China---- Bellagio Shanghai. Mr. Liu Yaning, the director of Diaoyutai MGM Hospitality said: "Lu Chuan is one of the leading Chinese film directors. He enjoys huge influence and popularity in the world. It is a great honor to have invited him to direct the brand film for Bellagio. The film is a perfect synergy of director Lu’s pursuit of art and the brand spirit of Bellagio hotel, accurate and profound. It allows people to experience wonderfully elegance, romance, beauty and art, and conveys the brand belief of ‘Nothing Short of Unforgettable’. We look forward to more cooperation with Lu Chuan in the future." The Bellagio brand film is now online at www.dytmgm.com, the official website of Diaoyutai MGM Hospitality. Please visit www.dytmgm.com/cn/brandlist.jspx for details. Lu Chuan is a Chinese director, screenwriter, and producer. He graduated from the Nanjing People’s Liberation Army Institute of International Relations and the Directing Program at Beijing Film Academy. Representative of Chinese new-generation director, Lu Chuan wrote and directed The Missing Gun, Kekexili: Mountain Patrol, City of Life and Death, The Last Supper and Chronicles of the Ghostly Tribe and Born in China, received over 40 international and domestic awards including Best Director at the 3rd Asia-Pacific Screen Awards, the Golden Seashell at the 57th San Sebastian International Film Festival, the Special Jury Prize at the Tokyo International Film Festival, the Best Film at the Golden Horse Award, the Hong Kong Film Awards, the Chinese American Film Festival. Bellagio is a luxury destination hotel brand from MGM Resorts International which headquarters in Las Vegas and is listed on the New York Stock Exchange. As a world leading hospitality and entertainment group, MGM Resorts International focuses on the development and the operation of a range of prestigious destination resorts under brands of Bellagio, MGM, Mandalay Bay, The Mirage, etc. Bellagio Las Vegas has been awarded the honor of "AAA5 Diamond" and during its 20 years of operation, it has been a pioneer in the luxury hotel portfolio of MGM Resorts International. Bellagio Shanghai unveiled its door on the Bund in Jan. 2018. It is the first Bellagio Hotel in China and the second in the world succeeding its sister hotel, Bellagio Las Vegas. Under the management of Diaoyutai MGM Hospitality which is the joint venture between Diaoyutai State Guesthouse and MGM Resorts International, Bellagio Shanghai is designed to create the welcoming, timeless, sophisticated and remarkable experience for its guests, which is the perfect incarnation of the brand core belief – “Nothing Short of Unforgettable”. Bellagio Shanghai boasts a panoramic view of the Bund as well as the skyline of Pudong Lujiazui. The Art Deco-inspired design, the four-floor high atrium fitted with LED screens, the 162 luxury guestrooms with the smallest in excess of 60sqm, the Lago restaurant by Julian Serrano from Las Vegas…Bellagio Shanghai will continue the legend of Bellagio brand. Diaoyutai MGM Hospitality is a joint venture between Diaoyutai State Guesthouse and MGM Resorts International. Taking advantages of the combined strength of the parent company brands, this high-end hotel management platform is focused to developing luxury hotels, resorts, residences, retail facilities and entertainment complexes, bringing a shared ethos of hospitality from China to the worldwide stage. With its core belief of “Combine to Innovate”, Diaoyutai MGM Hospitality is committed to creating innovative and welcoming experiences for its customers and guests, and is aimed to be the leading travel and living experience company. At present, there are four hotel brands under the management of the group - Diaoyutai, Bellagio, MGM and Mhub with a number of projects in Beijing, Shanghai, Shenzhen, Sanya, Hangzhou, Chengdu, Haikou, Nanjing, Qingdao, Frankfurt Germany and Bali Indonesia. Among them, MGM Grand Sanya in Yalong Bay, Diaoyutai Boutique Hotel Chengdu in Kuanzhai Alley, Diaoyutai Hotel Hangzhou by Qiantang River and Bellagio Shanghai on the North Bund have been officially opened. The Diaoyutai Mansion Frankfurt and Mhub Nanjing, Jiangning will have their grand openings in 2019.